Obituary for Marie DePinto | Fletcher Funeral & Cremation Services, P.A. 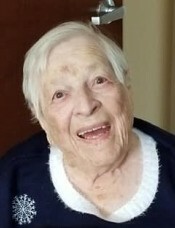 Marie DePinto, 97, went home to our Lord on Saturday, April 13, 2019 at Altercare of Mentor in Mentor, Ohio. Born February 15, 1922 in Heinrichsbrunn, Czechoslovakia, she was the daughter of the late Franz and Marie Schuster. She moved to Germany with her parents, brother, Henry Schuster (pre-deceased) from Munich, Germany and sister Hilde Hippel, Nuremberg, Germany. She was married to the late Bernard B. DePinto Feb. 2, 1947 in Fussen, Germany. During World War II, Marie was a pediatric nurse. One critical responsibility was being responsible to get the babies into bomb shelters when the sirens sounded off. Afterwards, Marie moved to Baltimore Maryland with her husband. She was sworn in as a US citizen on November 14, 1957 in Baltimore, Maryland. Marie is mother of Mike DePinto, Mauro DePinto (pre-deceased) and Anna DePinto, grandmother of Wendy DePinto, Michael DePinto (pre-deceased) and Ian DePinto. Marie lived at Timber Ridge Senior apartments in Westminster, Maryland before moving to Ohio in 2016 to be with her daughter. Marie formerly worked as the chef at Angelo's restaurant in Westminster for 13 years and after retirement she volunteered for Meals on Wheels for a few years preparing the meals. Marie was a devoted member of St. John Catholic Church in Westminster, Maryland. The family will receive friends on Wednesday, April 17, 2019 from 2 to 4 and 6 to 8 p.m. at Fletcher Funeral & Cremation Services, 254 E. Main St., Westminster. Prayer services will be held on Thursday, April 18, 2019 at 11 a.m. at the funeral home. Interment will follow in Lakeview Memorial Park. In lieu of flowers, memorial contributions may be made to Grace Hospice. Address: 7314 Industrial Blvd, Mentor, Ohio 44060.